For the third straight year, UTA will graduate a record number of degreed students by the completion of the 2016-17 academic year. Candidates for graduation will receive their degrees during winter commencement ceremonies Thursday-Saturday, Dec. 15-17, at College Park Center. See the Commencement schedule. 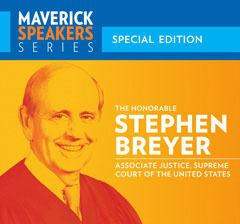 Spend an evening with Stephen Breyer, associate justice of the U.S. Supreme Court, for a special edition of the Maverick Speakers Series. Justice Breyer will discuss his recent book, The Court and the World: American Law and the New Global Realities, at an early start time at 7 p.m. today, Tuesday, Dec. 13, at Texas Hall. General admission is $5. Tickets are available at utatickets.com. LEARN MORE. The third candidate for provost and vice president for academic affairs will have a forum at 3 p.m. today, Tuesday, Dec. 13, in Room 108 of University Hall. The candidate will speak and then answer questions. Visit the Senior Leadership Searches webpage to learn more about the search for the provost and vice president for academic affairs as details become available. See how the traditional mortar board can transform into a message medium and fashion statement in the #MavGrad2016 Fall Cap Design Competition. Graduating students decorated their Commencement headgear with the hopes of winning a custom UTA prize package. See the entries and vote by liking your favorite by 10 a.m. Thursday, Dec. 16. Only likes on photos in the album will be counted, not on shares or reposts. All Facebook reactions will count as votes. Late Night Breakfast at the Connection Cafe is UTA's tradition for studying late for finals. Breakfast is served 9:30-11 p.m. today, Tuesday, Dec. 13. The UT System Louis Stoke Alliance for Minority Participation (LSAMP) is recruiting STEM (science, technology, engineering, and mathematics) UTA undergraduates for its Summer Research Academy. Funded by the National Science Foundation, the program is an intensive faculty-mentored research experience to apply classroom learning to real-time challenges. Women and traditionally underrepresented minority students are encouraged to apply. Applications are accepted through Wednesday, Feb. 15. LEARN MORE. Through Friday, Dec. 16—Final exams for fall semester. Monday, Dec. 19—First day of class for winter intersession. Late registration for winter intersession. Thursday, Dec. 22–Monday, Jan. 2—Winter break. No winter intersession classes.